This past weekend, I worked on a myriad of projects - many of them "UFO's" (Unfinished Objects.) 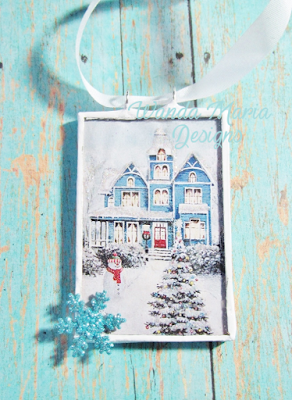 You name it, I have a gazillion projects in various stages of completion all over my craft room. 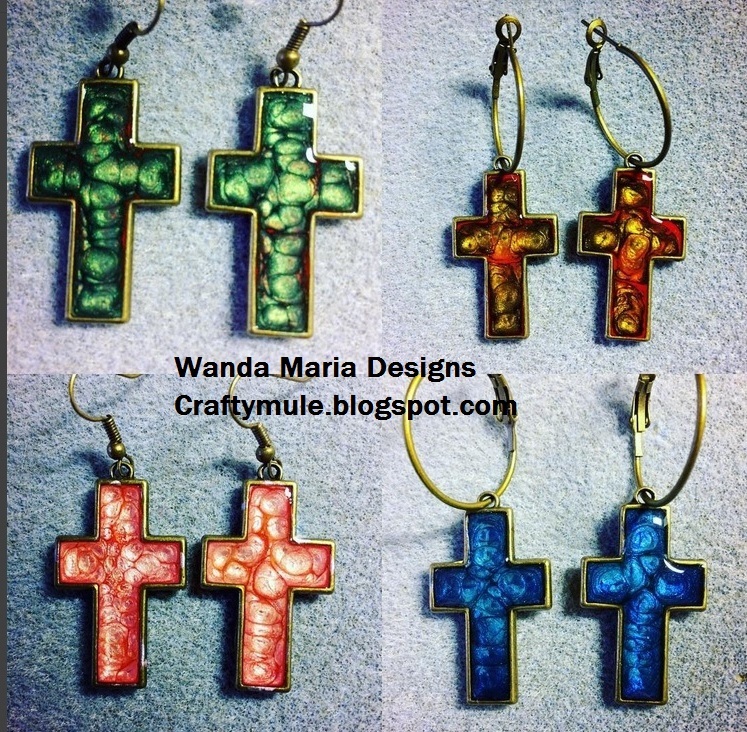 I decided to use my free time this past weekend to work on some of these, in addition to custom orders and the like. 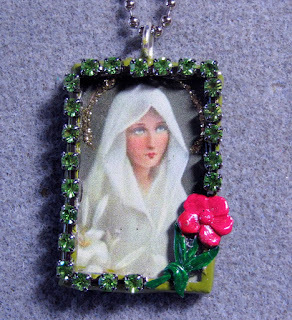 Some of the projects I have been dying to work on for quite sometime are items from Sandra Evertson's Relics & Artifacts line. I fell in love with several of the resin pieces in her line when they were first released a couple of years ago and have been stocking up on the collection ever since. I literally have a huge storage box full of them - I kid you not. Between attending college, working full time, traveling to Europe, spending quality time with my young grandsons and being preoccupied with my brother's terminal cancer, life literally got in the way the past couple of years and I did not get to spend as much time doing one of the things I love the most - creating. 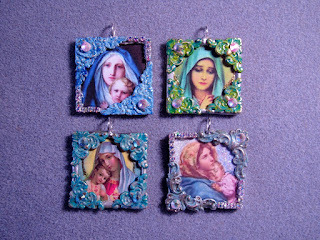 I realize I am behind in the art world as far as designing with this fabulous collection. 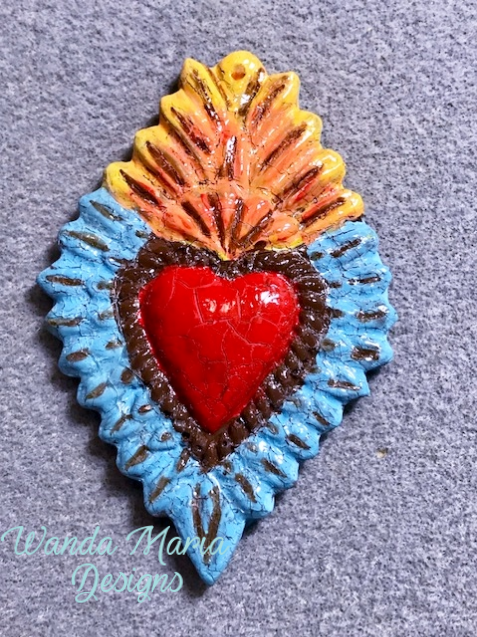 Several of my artist friends have inspired me with their interpretations of designing the Relics & Artifacts into gorgeous jewelry pieces, accessories and home decor. I finally jumped on the bandwagon this past weekend and made a few pieces of my own. I am pretty pleased with how they turned out. 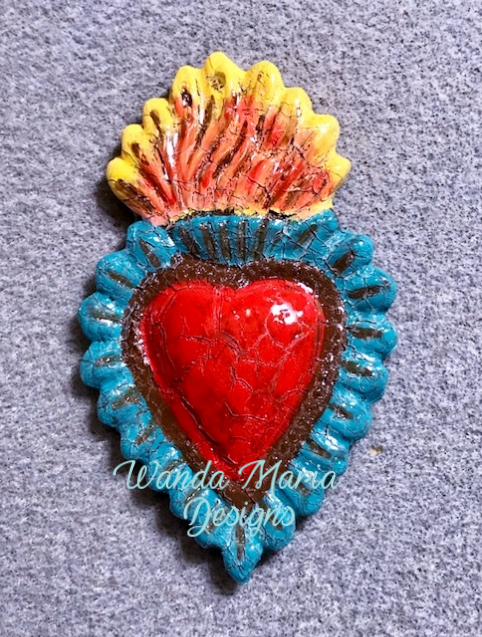 I painted the hearts with a base of brown paint and allowed them dry. I then coated the hearts with crackle medium and painted them in bright, cheery colors. Once the crackle effect kicked in, the brown color of the base paint showed through. I really love this effect. If I didn't know any better - I would swear the hearts were made of ceramic. They are stunning in person. 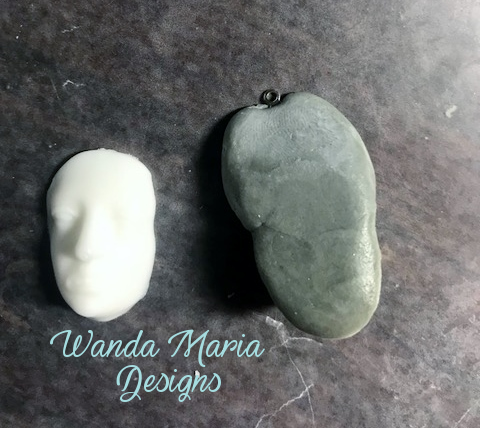 Cover the back of the face with Apoxie Sculpt; add finding at top of head. Wa-la! 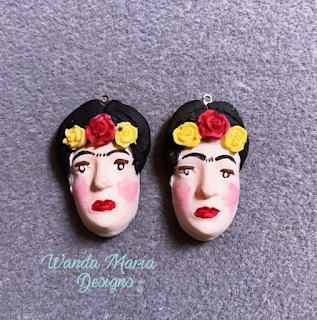 Frida Kahlo earring components! 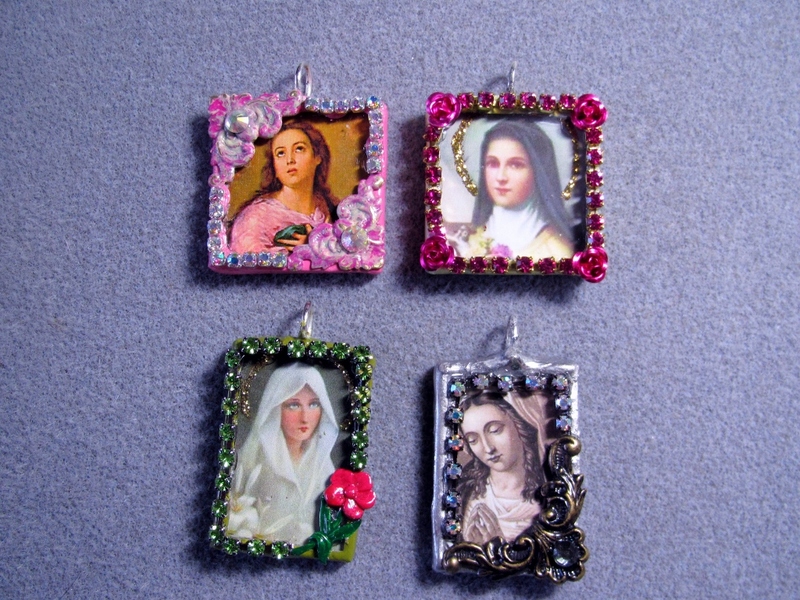 These are just a few of the projects I worked on over the weekend. 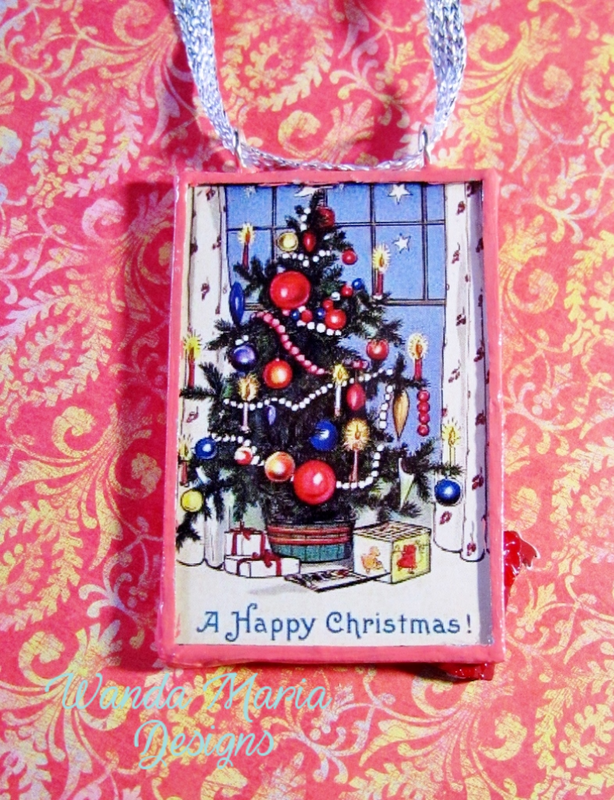 Stay tuned - I have several more to share with you in the coming days. See you soon! P.S. If you want some awesome inspiration from other artists utilizing the Relics & Artifacts collection, you might want to check out the Relics & Artifacts Tribe group on Facebook. 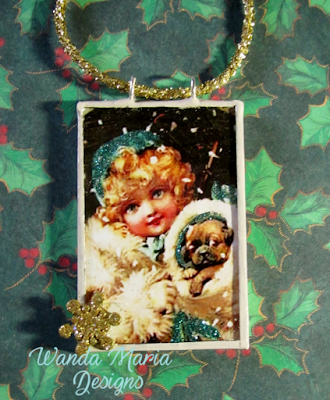 For added sparkle and interest, prior to soldering, I embellished several of the images with glitter glue. 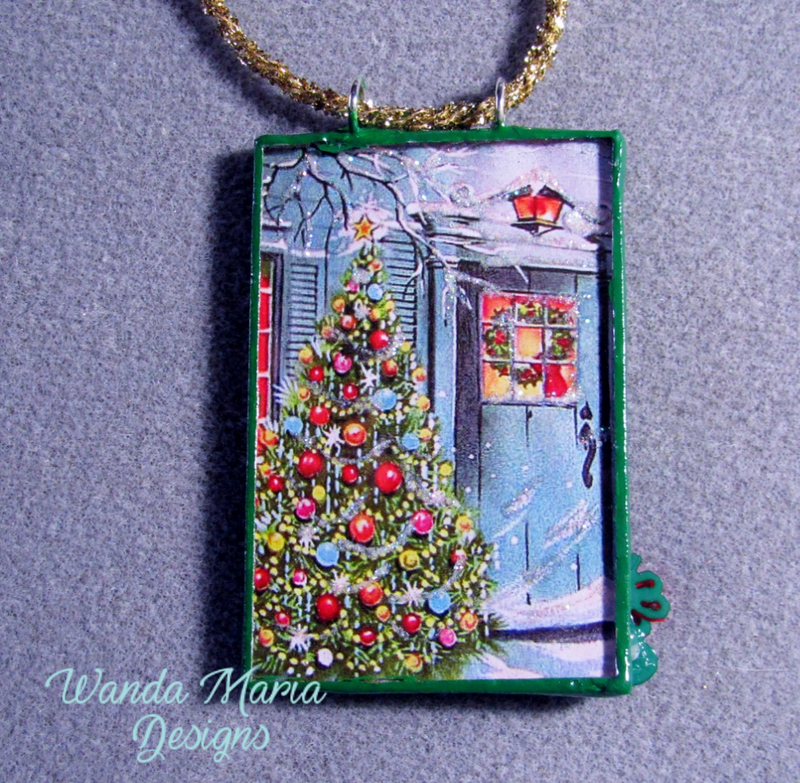 The solder was also colorized and a Christmas charm was attached to the front of the ornament. 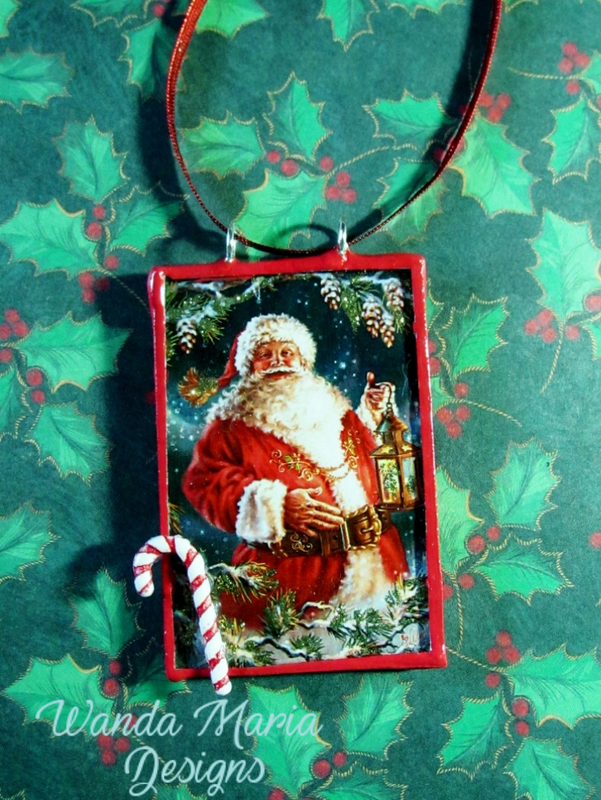 A complementary ribbon hanger was added for the final finish. 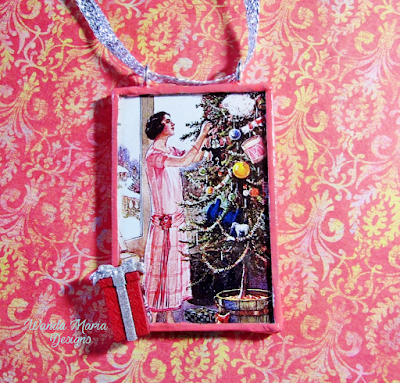 All of the ornaments are being listed on Etsy this week. 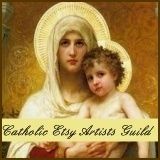 You can easily get to my Etsy shop by clicking the "shop" link header at the top of this page or on the link in this paragraph. 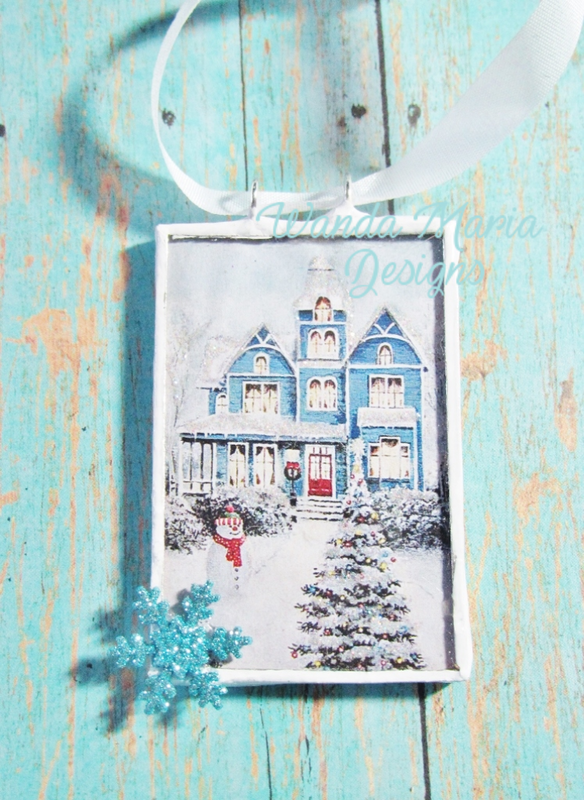 Blog Redesign and Name Change! Hello, everyone and welcome to my newly redesigned website/blog! As I announced on the Two Crafty Mules Facebook page last month, this blog was redesigned in order to mirror the Wanda Maria Designs brand. In addition, I wanted to make it more user-friendly and easier for readers to find tutorials, recipes, and the like on my page. So - here we are!!! 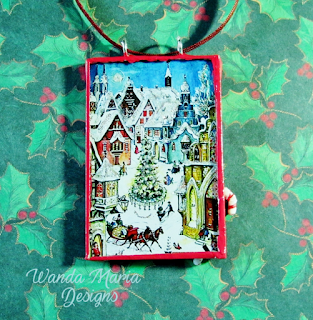 Cat Russell of Studio Paisley Cat redesigned my blog. If anyone is in need of a blog/website redesign, I highly recommend her. I am technically challenged - I will be the first to admit it. Cat held my hand during the redesign process and gave me guidance as it related to various aspects of posting pictures and information here. She was really wonderful! Cat can be contacted through these sites: Facebook, Design Studio, and Blog. 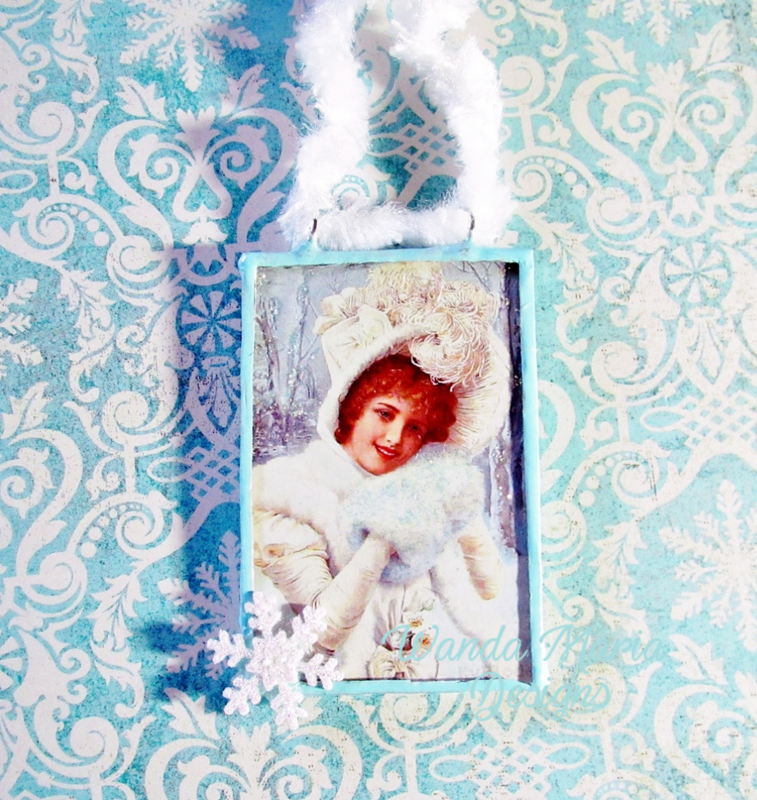 It seems like a million years since I have posted anything artsy on my blog. For those of you who have stuck it out with me - thank you so much! I recently got the itch to solder jewelry again. The last time I soldered was about 8 or 9 years ago. For some reason, I just decided to pick it up again. 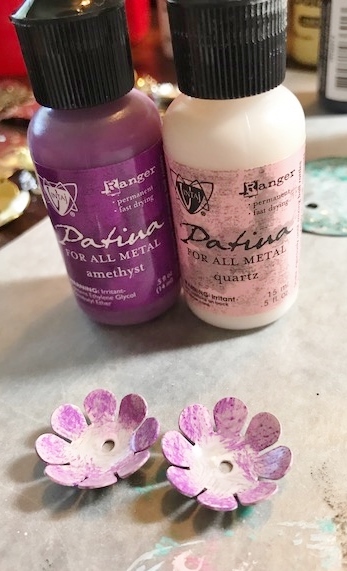 Of course, being the kind of person I am, I don't just solder jewelry, I have to embellish my pieces with paint, filigree, rhinestones, rhinestone chain, stampings and other decorative details. 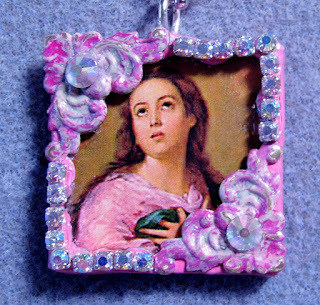 I have been attracted to bling ever since I was a little girl. 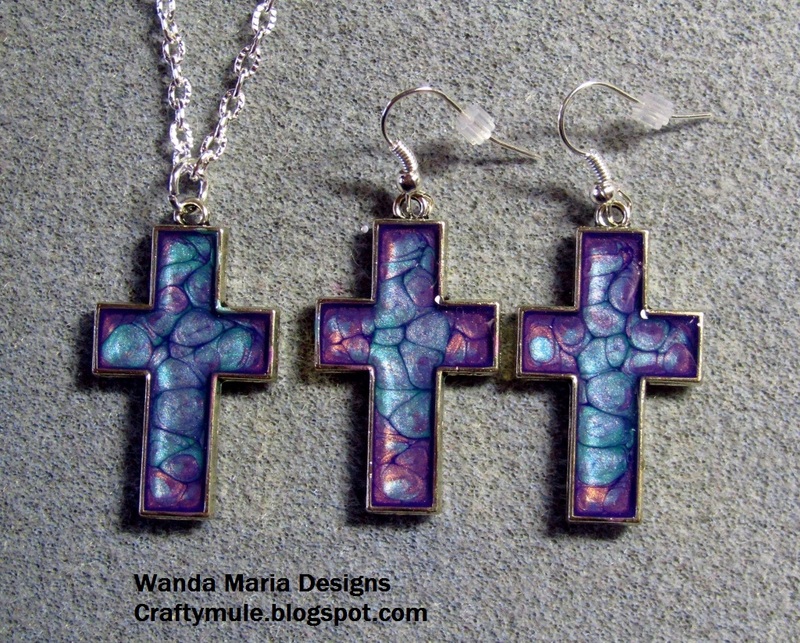 This evening, I posted several of my new soldered jewelry pieces to my Etsy shop. Soldered pendant with painted/sanded filigree and rhinestones. 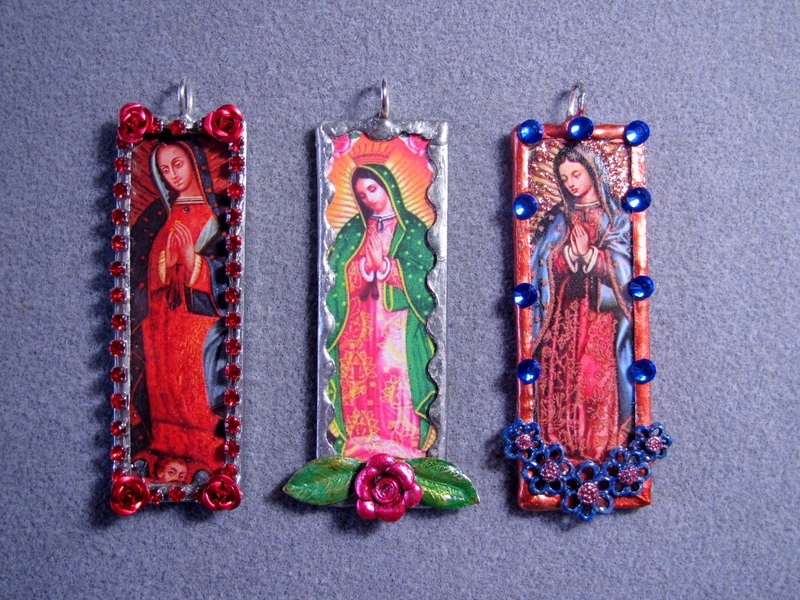 Three versions of blinged-out Our Lady of Guadalupe pendants. 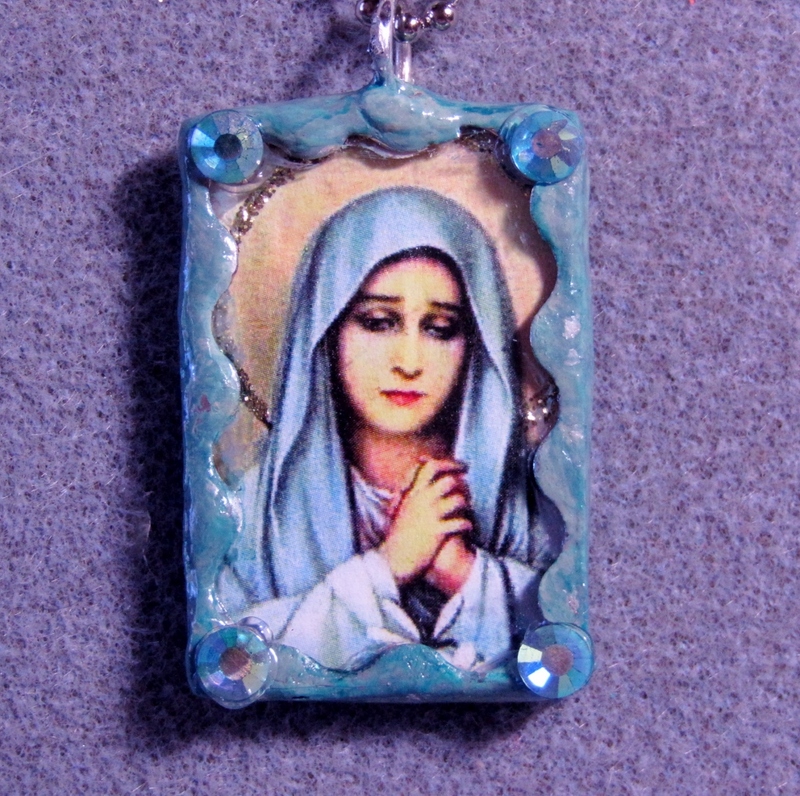 Virgin Mary with rhinestone chain and painted/sanded filigree stamping. Rhinestone chain and metal stamping Virgin Mary necklace. 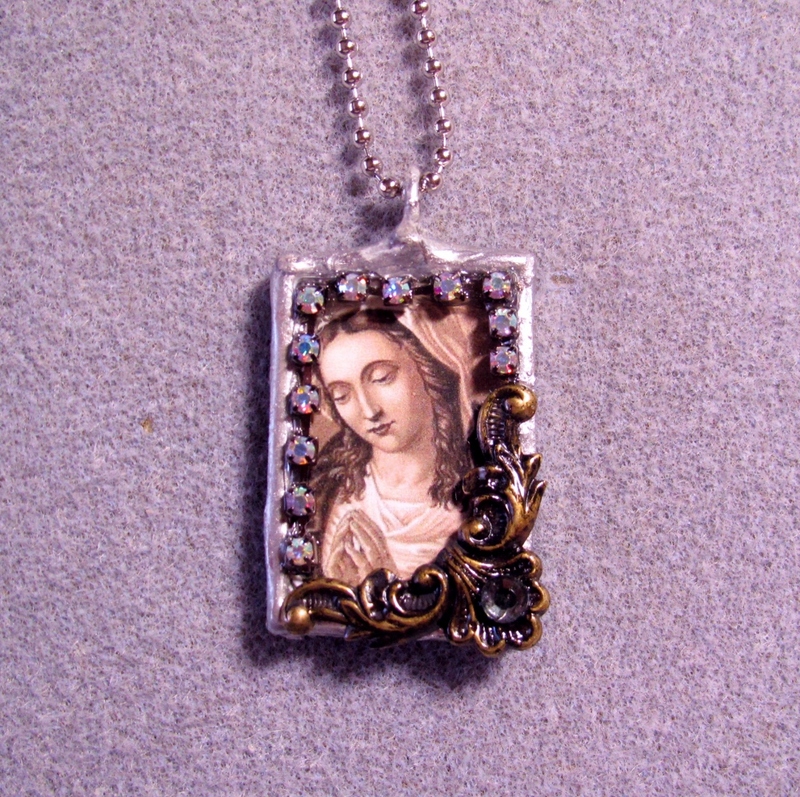 Rhinestone chain and painted/sanded filigree stampings. 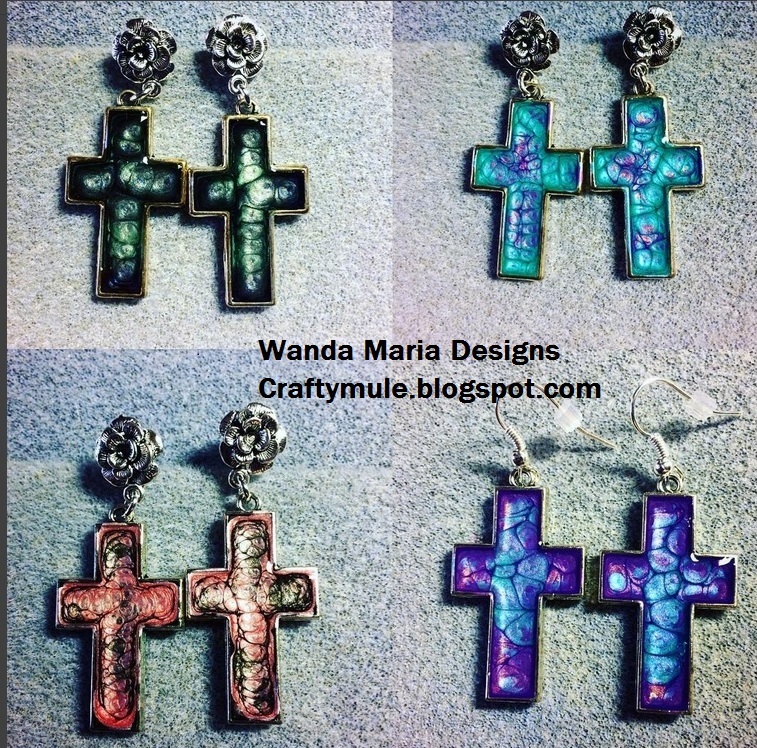 Painted solder and Swarovski crystal rhinestones. 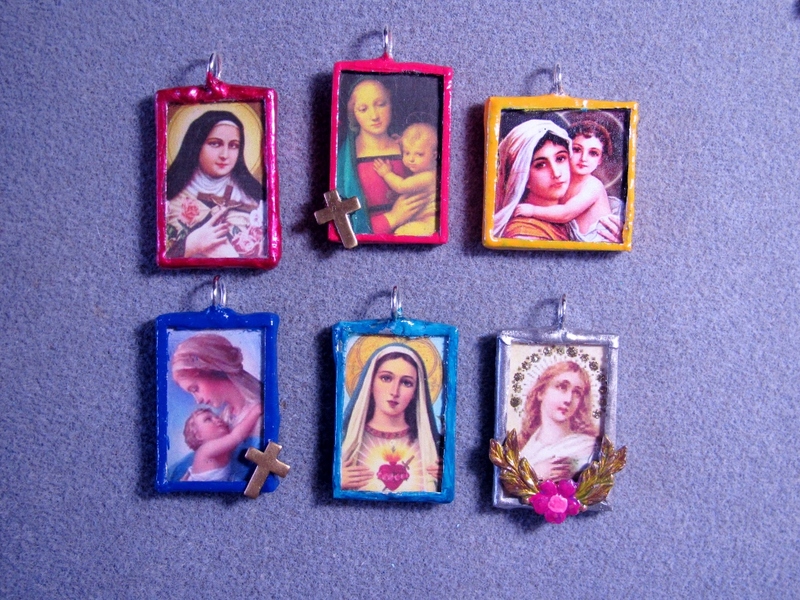 A collection of soldered and painted pendants. 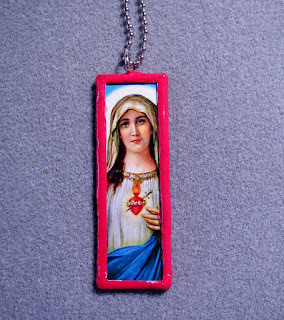 Side one of a reversible soldered necklace - Immaculate Heart. 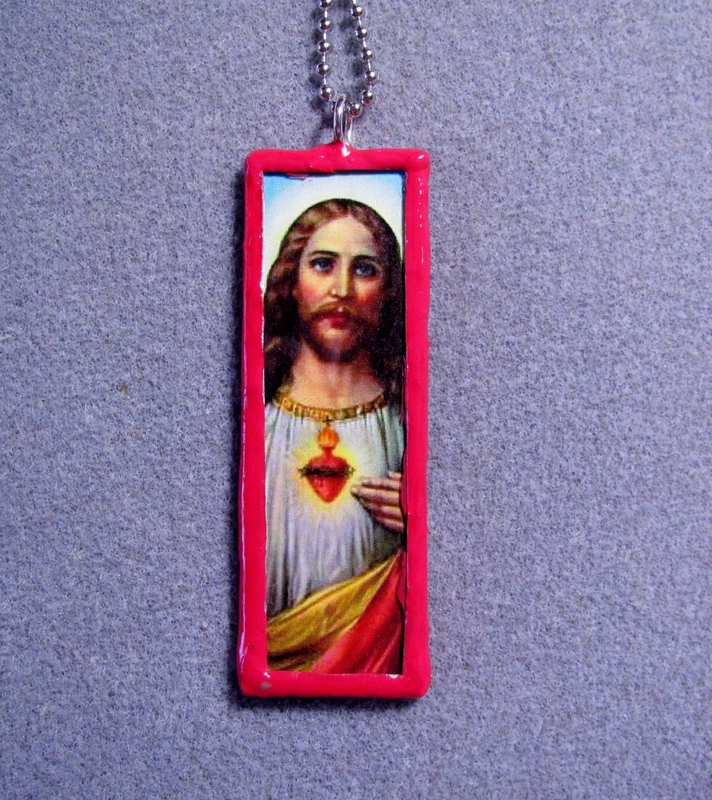 Side two of a reversible soldered necklace - Sacred Heart. 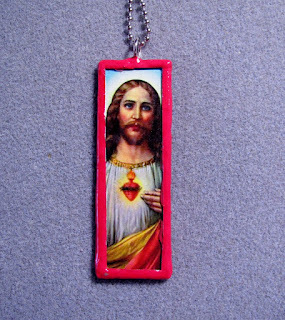 Please check out my Etsy shop to look at all of the new designs. Of course, you can also follow me on Instagram, where I share my work and travel experiences on a pretty regular basis. Metal earring components - embossed, cut out, painted and riveted. 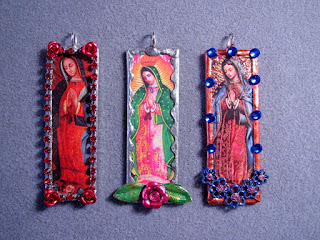 I don't know about you, but it seems that when I work on my jewelry designs, I tend to do so in an assembly line fashion. Overall, it saves me time in completing several projects, however, it also takes awhile for my finished pieces to come to fruition. 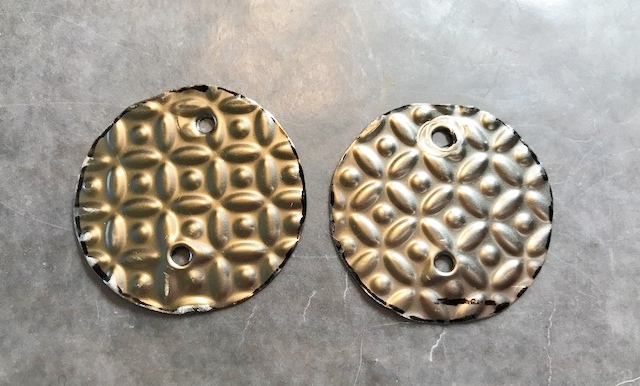 True to form, I have several pieces of metal embossed and painted for up and coming jewelry designs; several of these are still waiting to be incorporated into necklaces, earrings and bracelets. 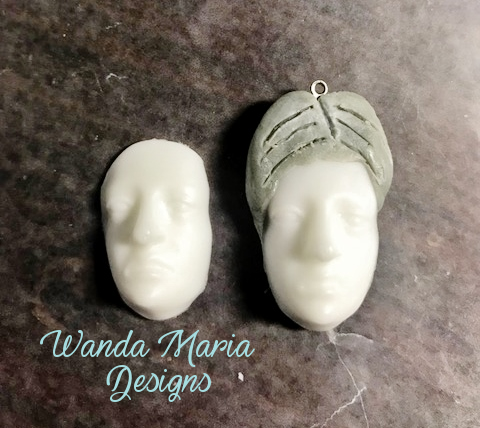 For this blog post, I want to share some pictures of my process with you. I hope it helps to get your creative juices flowing. 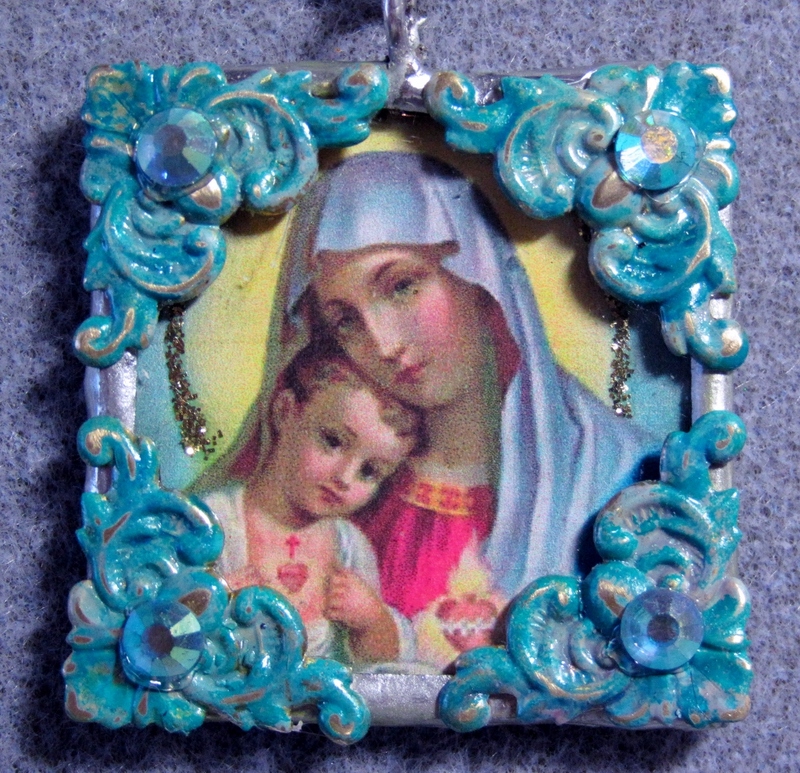 For this post, I will focus on the earring components shown in the upper right hand corner. First, I embossed my metal, then I cut it into the desired shapes (circles) and sanded the edges. 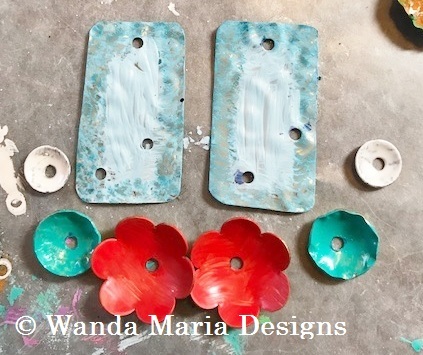 I also punched holes in the spots where I want to attach my flowers with rivets. These pieces will serve as the base of the earrings. 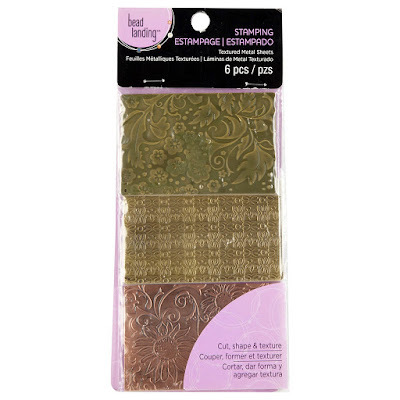 Embossed, cut, sanded and punched metal pieces - these will serve as the base of the earrings. I painted the metal circles with Vintaj Patina colors (Verdigris, Marine and a touch of Onyx around the edges.) After painting, I sanded over the tops of the bases to give them extra depth. 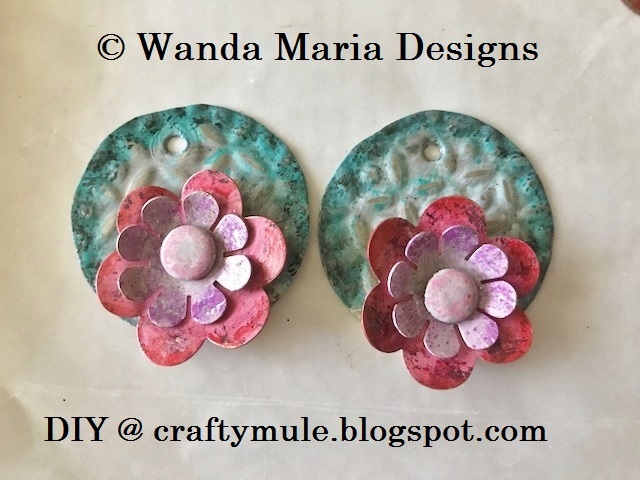 Next, I took metal flower stampings and punched holes in the center of each flower. I then domed each one with a dapping block set. The flowers were painted in complementary colors with Vintaj Patina paints and alcohol inks, as shown in the photos below. Last, but certainly not least, I attached the flowers to the round metal bases with rivets. 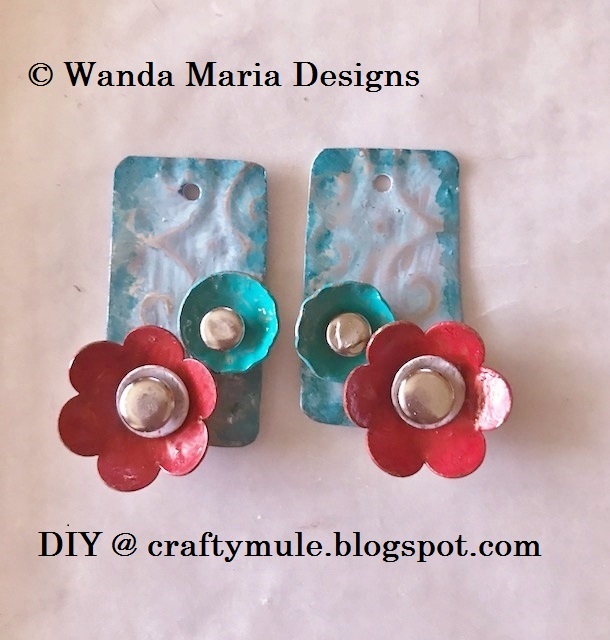 The rivets, which serve as the centers of the flowers, were also painted to complement the overall design. 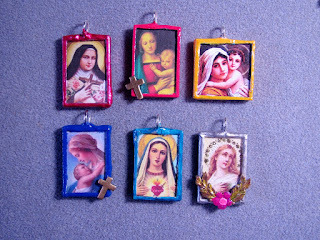 Painted metal pieces prior to assembly. 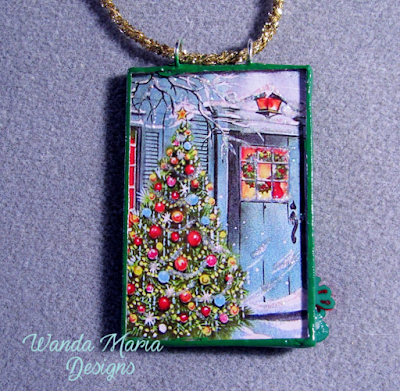 In my next blog post, I will share several completed painted metal jewelry designs. Please be sure to check back regularly! "See" you soon! 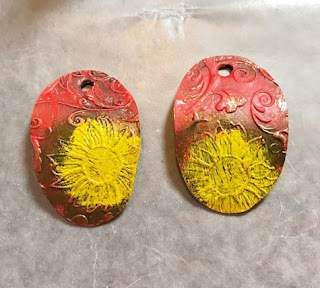 Sunflower (metal) jewelry components - cut, colored and sanded. 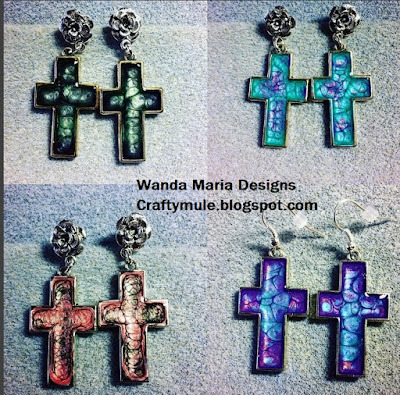 Long before it became all of the rage to color metal jewelry components, I used to color my metal jewelry pieces with things such as Sharpie markers and acrylic paint. 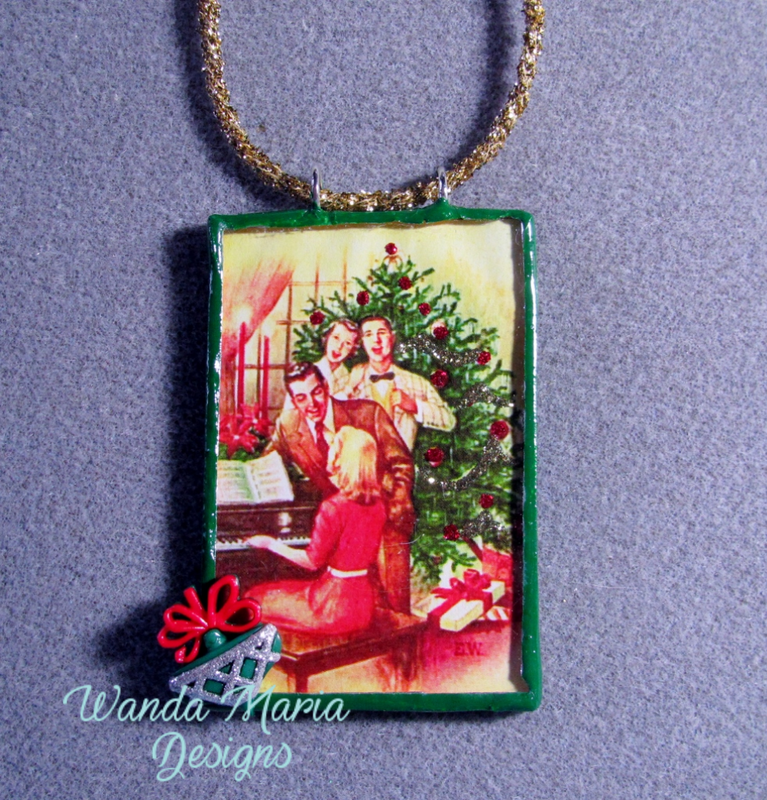 I would then seal the pieces with a glaze to make them more durable for everyday wear. I will be heading to Europe this fall, visiting Italy, Germany and France. 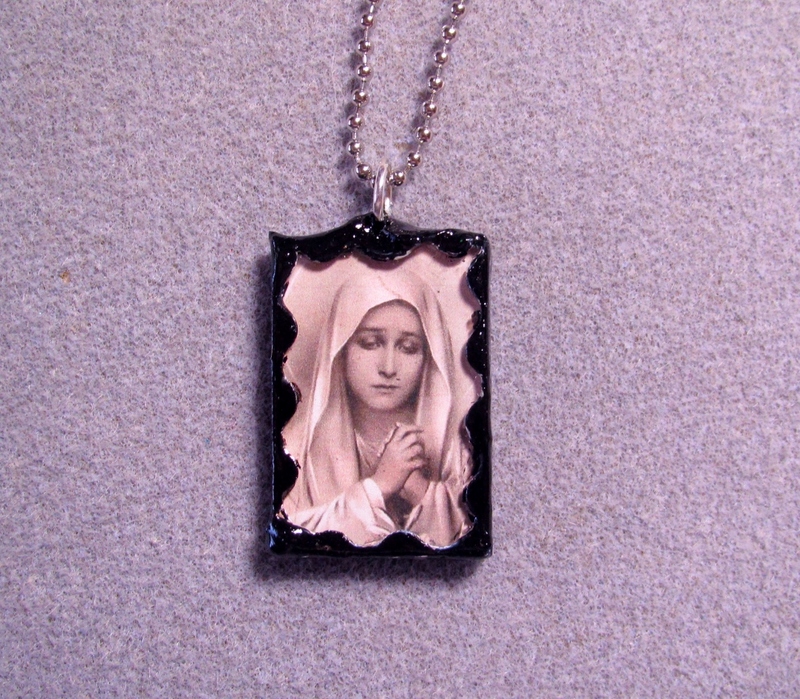 (It is my gift to myself for graduating "with high distinction" from college this past May.) :) One of the things that always reminds me of Italy are sunflowers which are so prevalent in the fields of Tuscany. 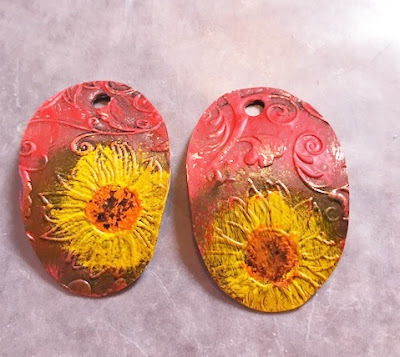 That inspired me to make some sunflower-themed jewelry components. 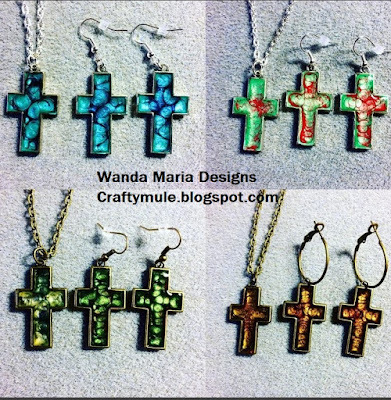 The set shown below is one that I have made for myself. The larger center piece will be made into a long, boho-style necklace; the smaller pieces will be made into matching earrings. 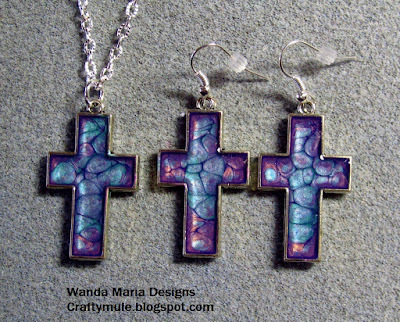 I plan to wear these on my upcoming vacation. 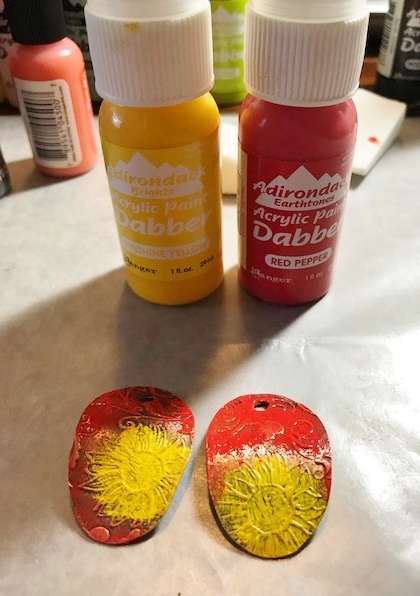 Since I was on a roll making sunflower-themed pieces, I thought it would be fun to share my process here with others who may be interested in trying this technique. The pictorial below is for sunflower earring components. 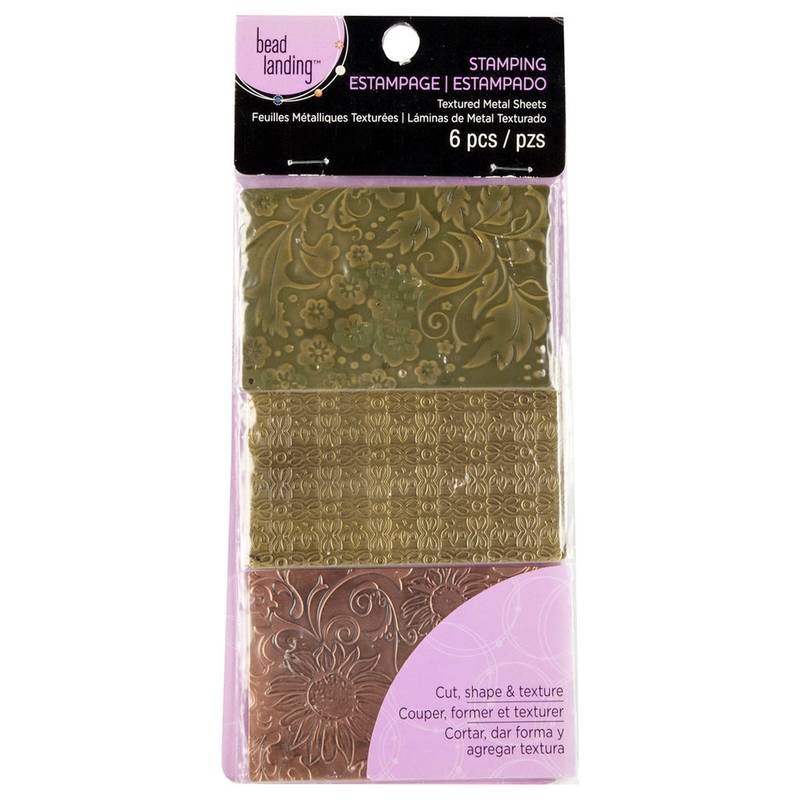 I cut out two oval shapes from Bead Landing's pre-embossed metal sheets I purchased at Michael's. (Of course, you can always emboss your metal yourself in order to create a truly one-of-a-kind piece of jewelry art.) 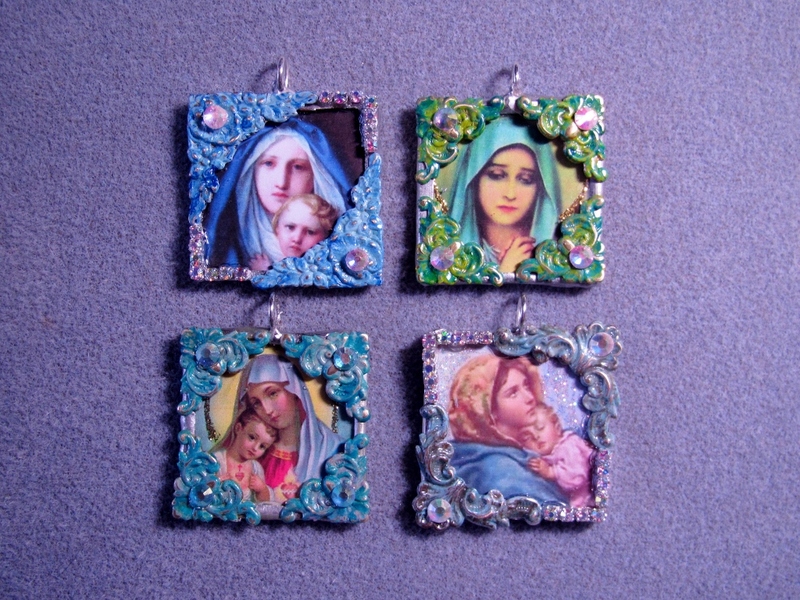 I punched holes in the top for the ear wires, as well. 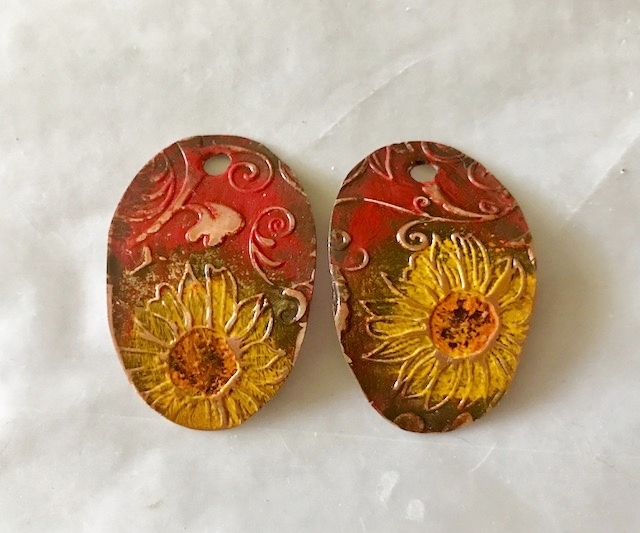 I used the sunflower sheet shown at the bottom of the package to make the jewelry designs. I took Vintaj Metal Patina in the color Earth and dabbed on the color outside of the sunflowers and around the edge of the components to make them pop. 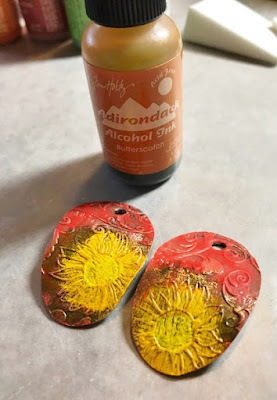 I applied a light touch of Butterscotch alcohol ink to the flowers to give them a golden glow and to add depth to the image. 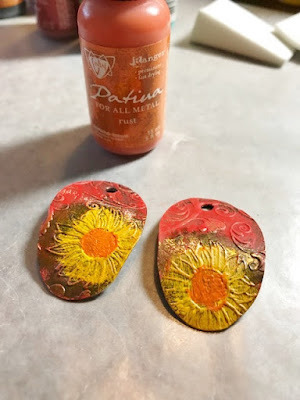 I dabbed Vintaj Patina in Rust to the center of the flowers. 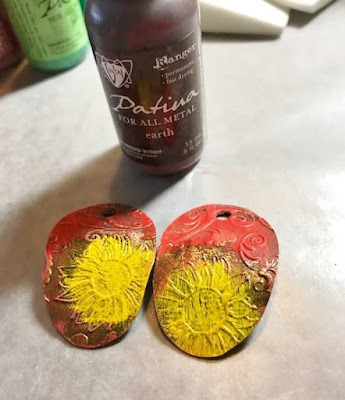 With a very dry paintbrush, I picked up a little Vintaj Patina in Onyx and applied it sparingly to the center of the flowers. The painted components before sanding. Last, I brushed a light coat of Vintaj Glaze over the top of both pieces and let them dry. Once dried, I sanded the tops and sides of the painted pieces with a fine grit sandpaper. As you can see, this really adds texture to the design. Simply gorgeous! 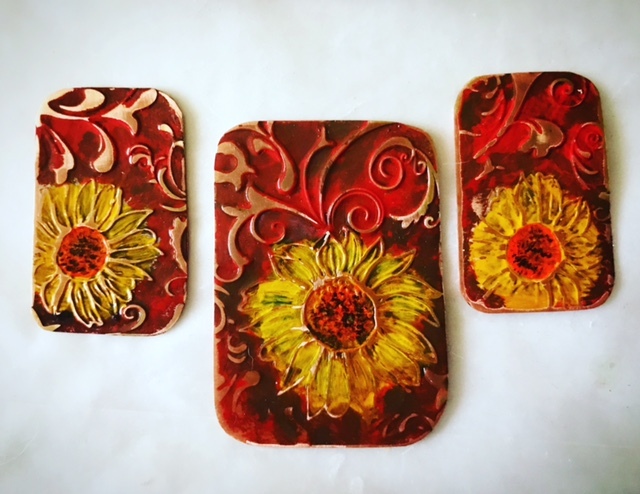 Completed pieces - painted, glazed and sanded. I will be sharing other metal component designs in Part 2 of this topic later this month. Please come back and join me at that time. I'd love to have you visit me here in blog land. And as always, please don't forget to join me on Instagram, where I often share pictures of jewelry projects in process. "See" you soon! 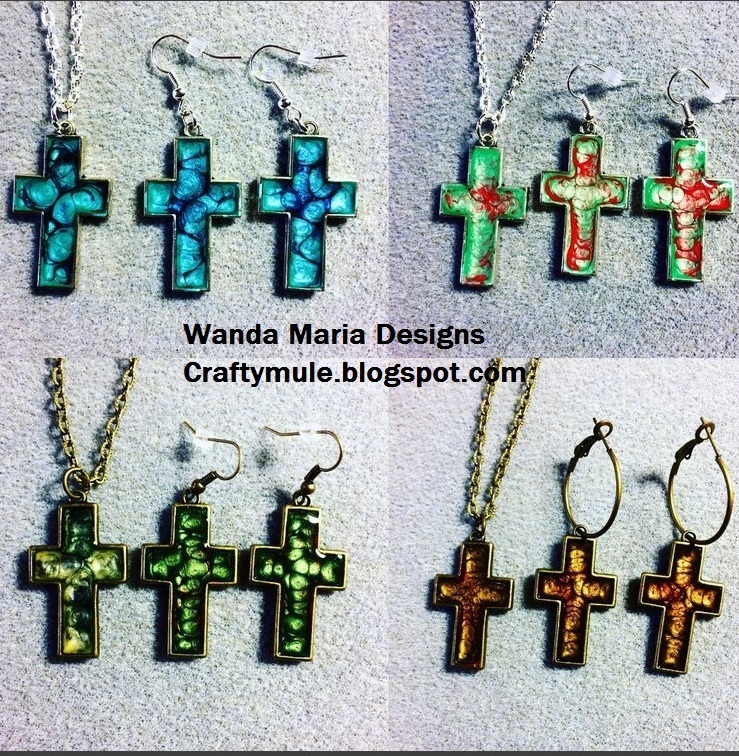 Pebeo Catholic Jewelry by Wanda Maria Designs. I recently became addicted to Pebeo's fantasy paint, particularly the Prisme version. I "discovered" it in the clearance section of my local Hobby Lobby store. After pouring through the pamphlets in the area regarding this paint, I was amazed that I did not know about this magical paint before. How is that possible? 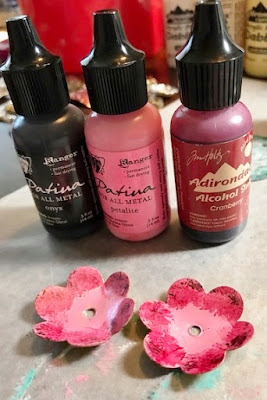 I'm not sure what the situation was concerning the paint, however, on the Facebook Pebeo group page which I belong to, someone mentioned that Hobby Lobby was clearing it out because of lack of interest/ineffective marketing. I'm not sure how true that is, that's just what I found out through the online rumor mill. Since my initial discovery and purchase of this paint, I have purchased several additional bottles online and from a local art store in my area. 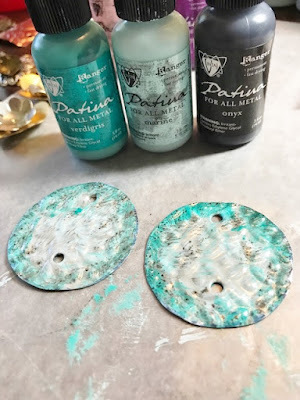 I have been experimenting with applying different color combinations of this paint on different materials, such as on metal, glass, wood, stone and other things. One thing is certain - regardless of which colors I use - the designs and patterns which form within the paint as it dries are simply beautiful and interesting. I added a coat of resin over the top of the paint on the jewelry pieces in order to better preserve them during wear. 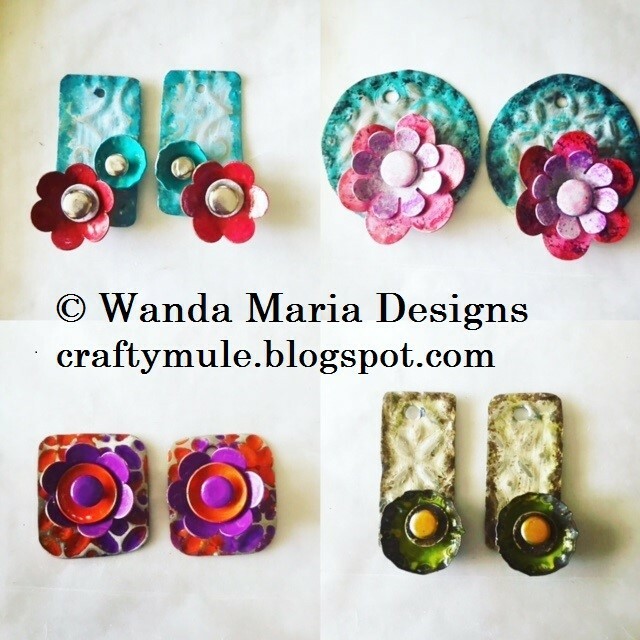 There are additional pieces I have made which I have yet to make into completed jewelry designs. 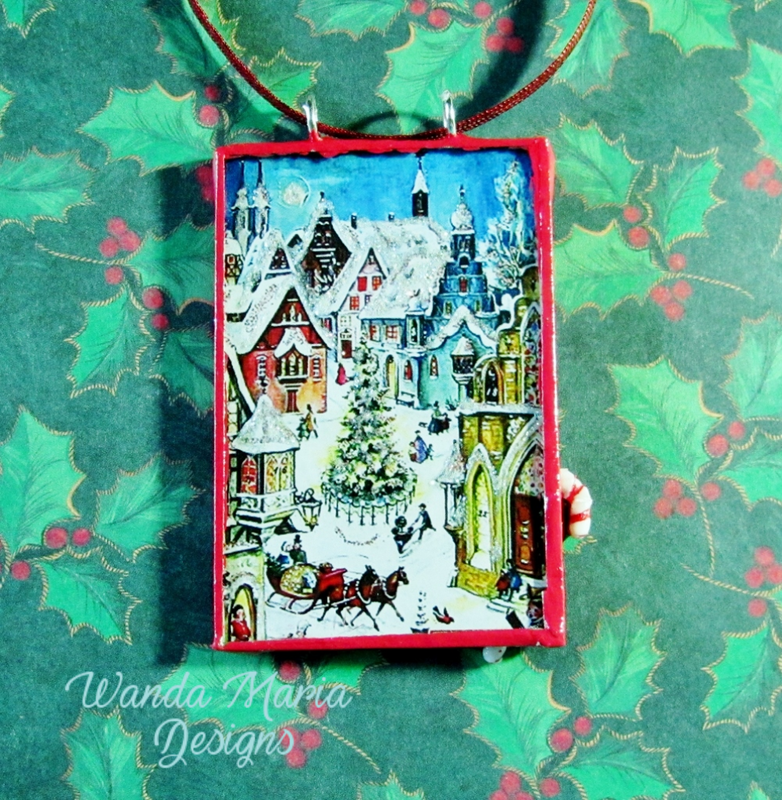 I hope to share more photographs here as I complete those pieces, as well as other new designs. 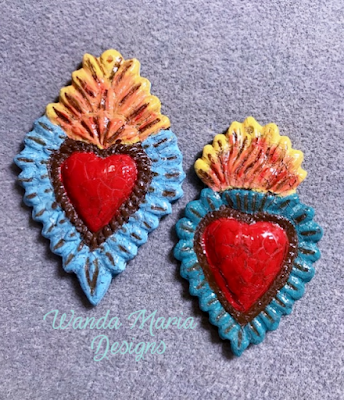 Be sure to check back here for upcoming posts on my latest polymer clay jewelry pieces and how to market/package jewelry pieces on a budget.